Fresno police arrested 22-year-old Brian Cooks and 19-year-old Isaac Stafford in connection with the shooting death of 9-year-old Janessa Ramirez. FRESNO, Calif. (KFSN) -- Fresno police have arrested two suspects in connection with the shooting death of a 9-year-old Fresno girl. Brian Cooks, 22, is the man Fresno police say fired one bullet from a 9mm gun that struck and killed the little girl. Officers say he was in a gun battle with a rival gang member -- Isaac Stafford, 19. Both are being held for the murder of Janessa Ramirez. She was standing in front of a West Central Fresno laundromat with her mother when she was shot in the stomach. Police say the $25,000 reward and tips from the community helped investigators solve the case. Both suspects were keeping a low profile after the murder and one left town. "Brian Cooks fired one round from this direction here that ultimately went 270 yards and struck Janessa," said Fresno Police Chief Jerry Dyer. Dyer showed a diagram of where the suspects were when they started shooting at each other 12 days ago. 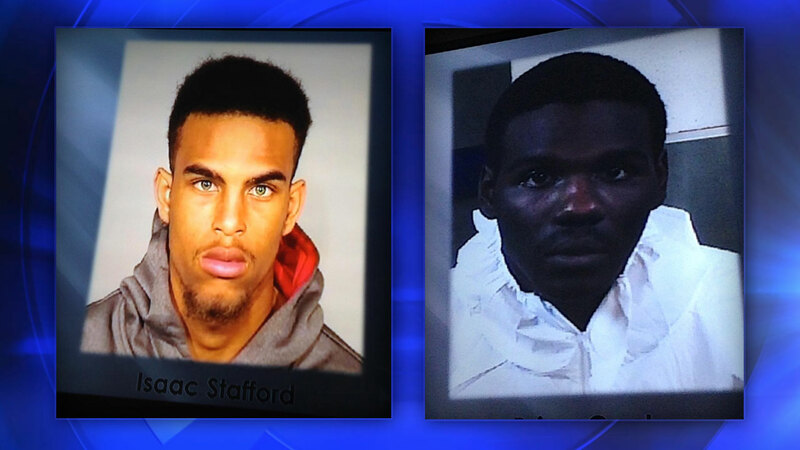 Detectives say Cooks was on a skateboard and Stafford was in a Dodge Challenger. "Approximately four rounds were fired from the Dodge Challenger towards Cooks. Cooks was crouched down behind a red vehicle that was parked on the street," said Dyer. None of the bullets hit Cooks. Investigators say he fired back once, and that bullet traveled nearly the length of three football fields -- hitting and killing Janessa. Police say the gang-related shootout was sparked by bad blood dating back three years and a shooting on Ashlan and Parkway that sent Deandre Robinson to prison. Court records show Stafford was the victim in the case and was going to testify against Robinson. "Stafford happened to be a key witness in that case, was labeled a snitch on Facebook, and there has been this ongoing feud since that time," said Dyer. Police say 10 tips identified each of the suspects by name. The $25,000 reward will now be divided among the anonymous callers who led investigators to the shooters. After his arrest, Cooks initially denied his involvement in the shooting, until detectives finally were able get the information they needed. "He did tell detectives that he knew the round that he had fired was the round that ultimately struck and killed Janessa Ramirez, and we have substantial evidence to be able to corroborate that as well," said Dyer. During a traffic stop two days ago, detectives did recover what they believe was the murder weapon. It was found with Cooks' friend, Devonta Murphy. Police don't believe he was involved in the murder, but was arrested for being an ex-felon in possession of a firearm. Police are still looking for the unidentified person they believe was with Stafford on the night of the shooting. Meanwhile, the memorial for little Janessa continues to grow as it has since that fateful Sunday night when an innocent trip to the store turned deadly. There have been vigils, memorials, rewards and tireless work from Fresno police detectives ever since Jan. 18 when Janessa was shot -- an innocent victim caught between rival gang members. "I forgive them, and I love them, and I hope they find the Lord so they can find peace in their heart," said Stacey Gonzales Ramirez, Janessa's mother. Gonzales Ramirez's words have resonated with city leaders, detectives and Fresno's mayor. "The message of forgiveness and a message of redemption -- that is in fact Janessa's legacy and that's what she'll mean to all of us," said Mayor Ashley Swearengin. Swearengin thanked Janessa's family for their strength and grace, and she thanked the detectives who logged 1,600 hours tracking down the two suspected shooters. "We're grateful for this major and important step towards justice today but we're mindful of the fact that it doesn't bring Janessa back," said Swearengin. As the mayor spoke those words, Janessa's mother was visibly upset. Gonzales Ramirez held her daughter as she cried after the shooting, and she held her as she took her last breath. "Now I have my full peace. My baby is in a better place," said Gonzales Ramirez. "I just want us to continue to have peace. Think of Janessa. She wouldn't want people fighting and being mean to each other." Those are words that Dyer hopes every citizen will hear. "Stopping the gang violence in Fresno -- that's what I hope will come from this and I know that's what the family hopes will come from this," he said. When asked what's next, Janessa's mom told Action News she'll continue to serve her community and says she wants to give back to everyone who has supported her since the shooting. 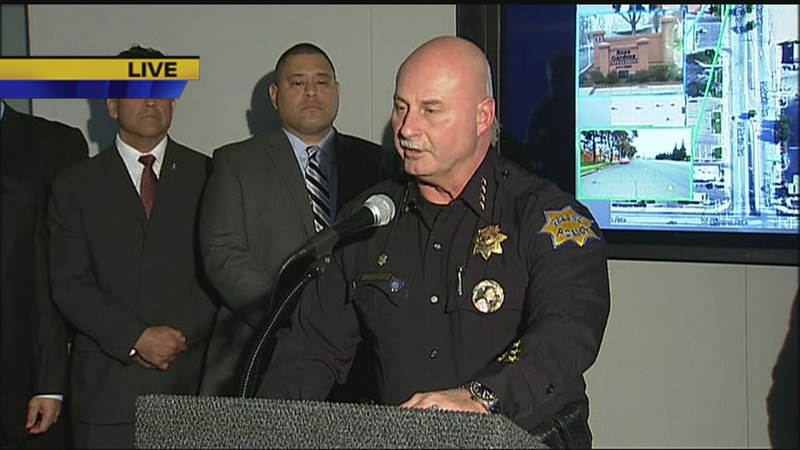 Fresno Police hold a press conference regarding the shooting death of 9-year-old Janessa Ramirez.